Alpha and Omega Semiconductor Limited (AOS) (Nasdaq: AOSL) a designer, developer and global supplier of a broad range of power semiconductors and power ICs, today introduced at the 2019 Applied Power Electronics Conference (APEC) in Anaheim, CA (News - Alert) (held March 18th - 20th) the AONV070V65G1 Gallium Nitride (GaN) 650V transistor, the initial product in the new aGAN™ Technology platform. Due to the superior GaN technology properties, the AONV070V65G1 is ideally suited for high efficiency and high-density power supplies in the telecom, server, and consumer adapter markets. These high-efficiency server power supplies are needed to reduce cooling requirements, maximize rack area, and minimize the associated energy cost. This 70mOhms pure enhancement mode device is manufactured on a fully qualified GaN-on-Si substrate technology that has > 50% smaller die area, 10X lower gate charge (Qg), and eliminates the undesirable body diode reverse recovery charge (Qrr) of traditional silicon MOSFET technology. For designers, the ease of use provided by the aGaN™ technology is enabled by the low on-state gate leakage that allows engineers the flexibility to drive the AONV070V65G1 with a selection of commercially available Si MOSFET gate drivers. 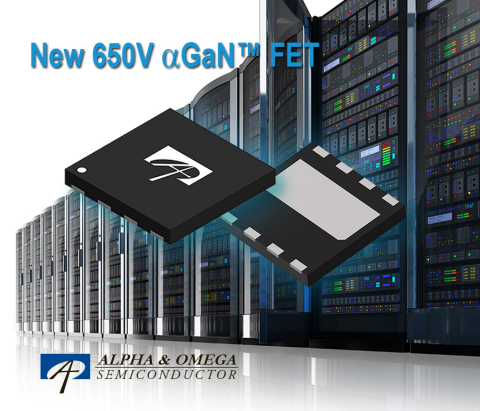 "We are very excited to release this new GaN™ technology product platform that will enable AOS to provide customers with the next generation of power semiconductor performance enabling system power density and efficiencies not possible with existing silicon technologies," said David Sheridan, Sr. Director of Wide Bandgap Product line at AOS. RDS(ON (News - Alert)) Typ.